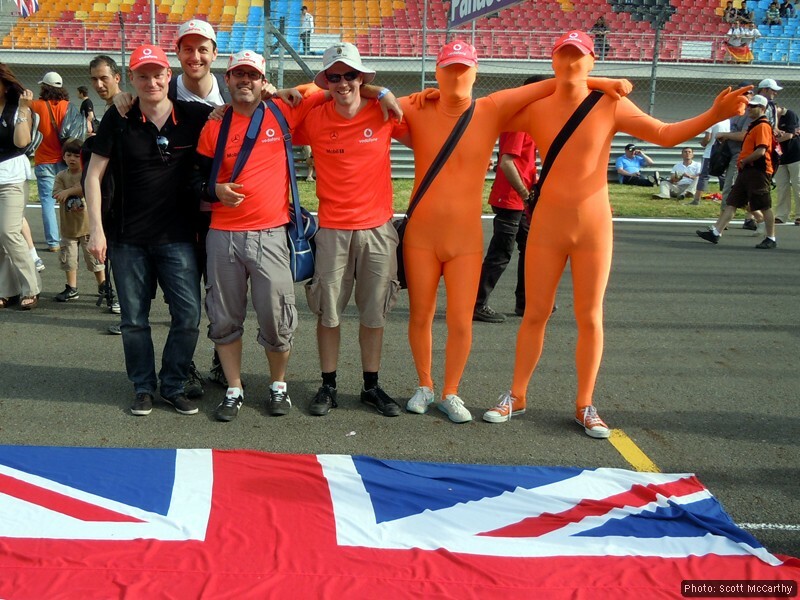 Brits on Pole’s reporter-at-large Scott McCarthy was at Istanbul Park for the Turkish Grand Prix where he grappled with dodgy bus drivers, over-priced cola and an invasion of Spanish fans dressed as matadors – not to mention seeing Lewis Hamilton and Jenson Button duelling right under his nose. Here’s his review of the weekend. I’ve been looking forward to this weekend all year – my first overseas F1 event since Imola 10 years ago, and my first ever trip to Turkey. But whenever I’ve been to other big motorsport events, such as F1 or Indycar, it’s always felt as if for one weekend the entire city beats to the pulse of the motor cars. Sadly, in Istanbul, that pulse has flatlined. No large banners at the airport. No billboards visible from the taxi to our hotel. Even on Friday morning, as I tried to find out where the buses pick up fans to take them to the circuit, there was no sign of anything F1-related at all. I couldn’t even find the bus. I was in Istanbul with three of my friends and between us we eventually found the bus, walking straight on with no queue, and off we went. Our hotel was on the European side of Istanbul, whereas the circuit is on the Asian side, so we knew we were in for a long bus journey. What we hadn’t bargained on was the bus driver not knowing his way to the circuit. After two hours I checked where we were to discover we had driven about 30 miles past the motorway junction and the bus driver had to pull over to ask for directions. Eventually he worked out where Istanbul Park was and we arrived at the circuit. Free practice 1 was already an hour in by the time we arrived. 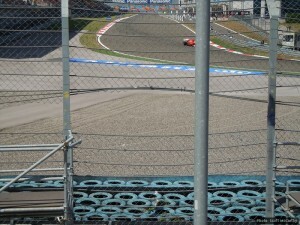 But, thankfully, things improved as we found our way to Grandstand One on the first corner with a fantastic view. We could see right down the start-finish straight and the first part of turn two to our right. 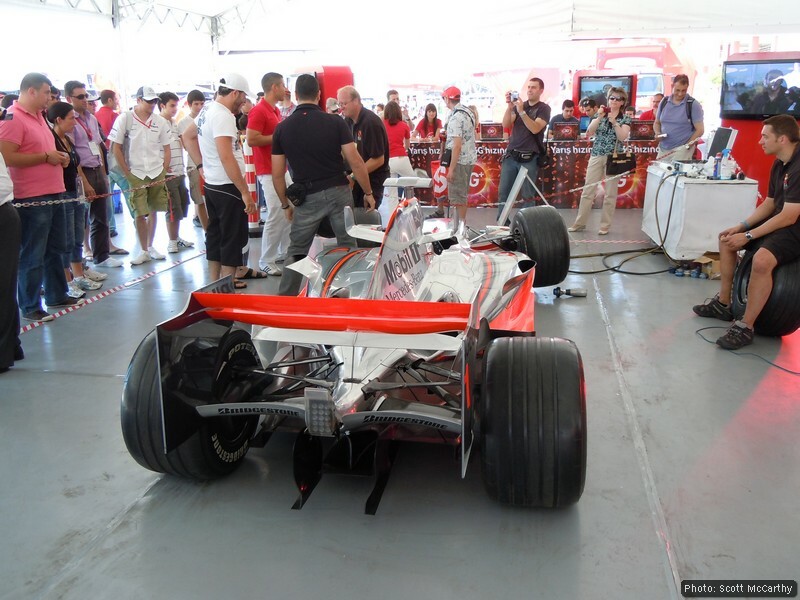 We could even see the first few garages of the pit-lane where we could just make out teams like Virgin and Lotus. There were very few spectators here on Friday which meant there wasn’t much of an atmosphere. On the plus side, I’ve never had a better ratio of toilets to fans at any other motorsport event I’ve ever attended! The weather was hot, and I mean HOT. Air temperature of 31 degrees and a track temperature of 51. Sadly, the Turks have discovered the art of ripping off F1 fans, as a bottle of water was £2, a Coke £5 and a burger £7.50. After first free practice we wandered to the “F1 Village” behind the main grandstand. There was a selection of merchandise stands, but fewer than I’ve seen at other events. You could also attempt a pit-stop challenge or try your hand at driving Istanbul Park on a video game in a stand belonging to a local radio station. 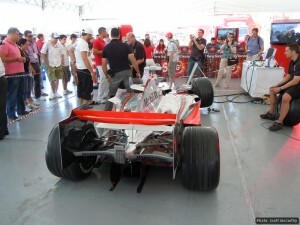 There didn’t appear to be any planned “meet the driver” sessions and the only team-specific stands were for McLaren and Ferrari, which just sold merchandise. You get far more at Silverstone than you do here, although I suspect it’s all down to supply and demand. It’s simply not worth laying on extra food vans or merchandise stands if you’re not going to get the crowds to justify it. Despite all these things, it really made no difference to our enjoyment. For us, Friday tends to be a reconnaissance mission where we scout out the best-value food stands and where to find the people selling water at a quarter of the price just outside the circuit. 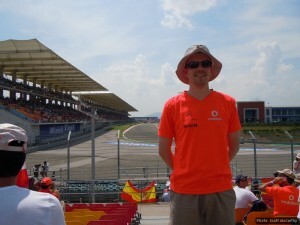 We weren’t here to buy t-shirts or to see large F1 flags – we were here to see some racing. We watched all the F1 and GP2 sessions and couldn’t get enough of the noise as the cars went past. The following day, and after several more hours on a bus between the circuit and the city, we were back and ready for more. The crowds were much larger, but still nowhere near capacity. If our stand reflected the circuit as a whole then I’d say it was an even split between Alonso fans and, surprisingly, Petrov fans. It would seem the geographical proximity of Russia has brought them over in droves to support their man, who I suspect never expected to see so many Russian flags with his name on. It obviously had a positive effect as he put his Renault a respectable ninth on the grid, a result which was much appreciated. 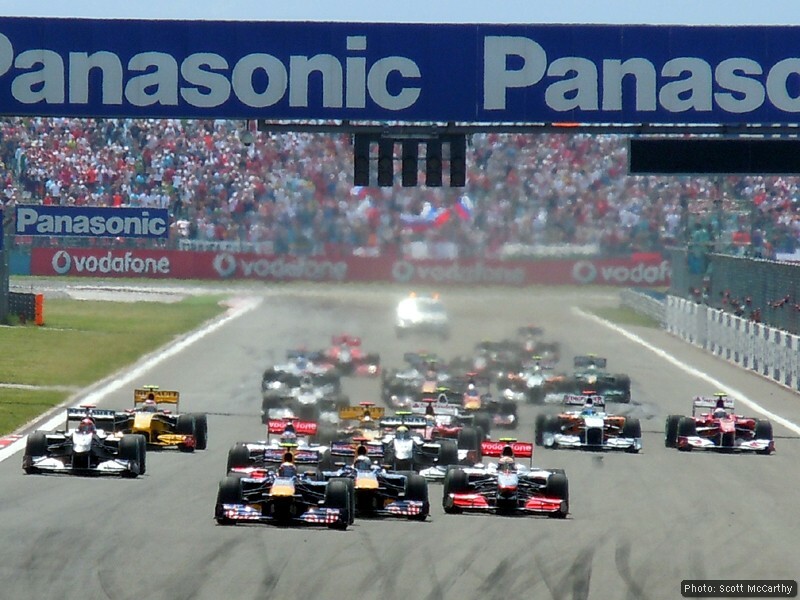 By contrast, we didn’t hear a peep out of the previously lively collection of Spaniards around us after Alonso failed to make it into Q3 – many of them sulked off home before Webber earned pole position for the race. As the crowds drifted off we grabbed a few minutes’ shade under the grandstand before heading back to our seats. The GP2 cars were revving up for the first actual race of the weekend. 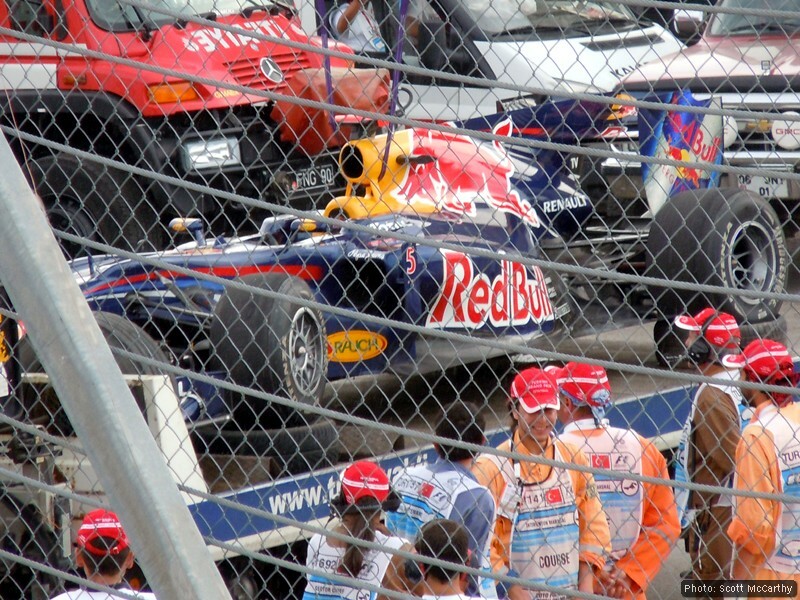 We were sitting at the first corner, so we were secretly hoping for the odd prang – but nothing ferocious enough for anything to fly through the worryingly large hole in the fence in front of us. Sadly (or luckily) for us the current crop of GP2 drivers are too well-behaved for that and everyone made it through the first corner intact. It was an exciting race and the handful of Brits left in our stand enjoyed watching Sam Bird climb from fifth to get his first GP2 podium. We had a great view down the main straight of his first attempt at taking fourth place, all of us a little concerned that the move might end with a heap of carbon fibre at our feet. With the day’s track action concluded we headed off to the reasonably short queue for the buses, and back to the European side of the city, very much looking forward to race day. And so race day arrived – for the first time it really felt like an F1 event. A much longer queue for the bus. Far more flags and banners in the grandstand, and some VERY vocal supporters. 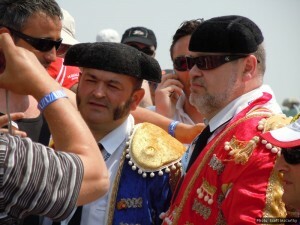 In particular, about 20 minutes before the start, a group of Spanish fans in full matador dress were accompanied by a loudspeaker blasting out traditional Spanish music. It was good-natured but unfortunately timed as – unknown to them – they were drowning out the Turkish national anthem. Upon discovering this they turned off their music and sheepishly took their seats. I suspect they already knew the chances of hearing their own anthem at the end of the day would be fairly slim. With the stands about 80 per cent full there was a much better atmosphere today. 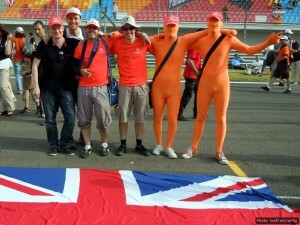 The Brits were easy to spot as we were all dressed in our McLaren Sunday best. It was seriously hot and we were in direct sunlight. I was convinced I’d have the Vodafone logo permanently branded into my back – maybe this was all part of McLaren’s innovative sponsorship plan? With great excitement we watched the cars head out on their parade lap. This was the first race I’ve been to where I could see the grid. The cars formed up, the fans’ air-horns were at the ready, then lights out and GO GO GO! 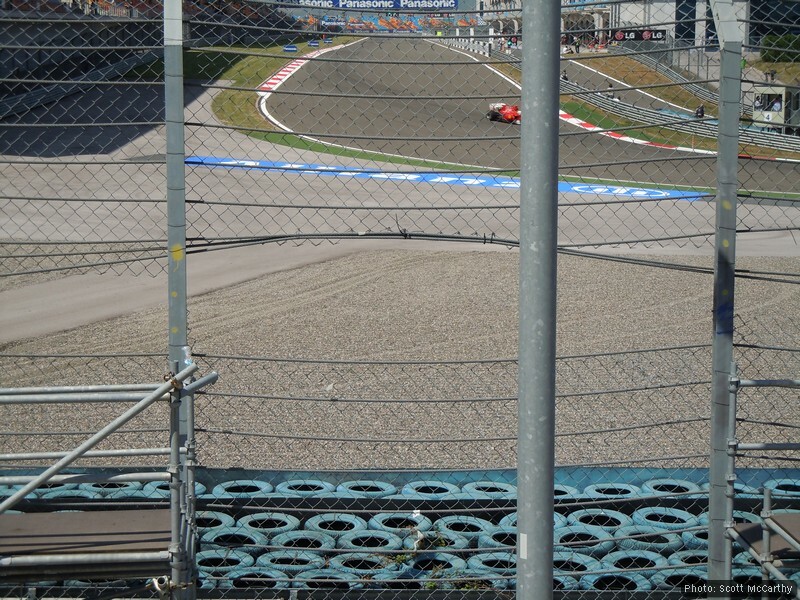 No first-corner prangs, which was a shame as we’d have had a great view. Vettel slipped past Hamilton and out of view to our right. We then began our information-gathering mission which involved watching the screen opposite us and exchanging text messages from friends watching in the UK. One big disappointment for Turkey this year was that the makers of Kangaroo TV decided not to cover the event. I’ve never used one before but have heard good things about them. It’s a real shame that I needed text messages from England to tell me things like “Webber told to save fuel”. Lap after lap we could see Hamilton trying to get past Webber down the main straight, but not quite managing it. After the pit stops we had two Red Bulls followed by two McLarens and were just starting to think the race was going to fizzle out and we’d already seen all our excitement for the day. However, we could see a large cloud heading our way, and the wind was picking up. Could we be getting some rain? A few more laps and I didn’t need my sunglasses any more. It was definitely getting darker, but not quite the thick black clouds you’d associate with a downpour. Suddenly there was a commotion. We looked up at the screen to see Vettel having a go at Webber down the back straight. As they banged into each other everyone leaped to their feet and, in a fairly unsympathetic way, the Brits cheered and punched the air – our boys in first and second. We’d barely got out breath back when we saw dark spots appearing on the ground in front of us. It was raining! But did we want it to rain now? Next thing we knew, there was another commotion. The two McLarens were having a go at each other through the last few corners. We were on our feet again to watch them appear onto the main straight, with no idea which was which by this point but just hoping it didn’t go the same way as the Red Bulls. I was holding my breath the whole time they were flying down the straight and was mightily relieved to see them head out of view with all eight wheels pointing in the correct direction. Things calmed down a bit after that. The rain stopped, the McLarens decided there had been enough in-team crashes for one Grand Prix, and the Spanish fans started to accept the reality that Alonso was NOT going to carve his way through to field to win. A truck carrying the remains of Vettel’s car slowly trundled past the front of our grandstand as we all leapt up to take some photos. So, as the chequered flag fell, the Brits cheered a fantastic 1-2 and an action packed race. As we were getting ready to watch the podium on the big screen we were presented with an unexpected bonus. They had opened a gate and were letting us onto the track. Unfortunately we were furthest from the gate so had no chance of being there in time for the champagne, so we watched on the screen instead, joined in with “God Save the Queen” and then headed onto the track. Security guards were standing on all the gaps in the pit wall to prevent us running riot in the pit-lane, while some marshals were offering to sell their officials bibs for upwards of €30. Someone else was walking off with a big safety car sign he’d swiped from an unguarded marshal’s post. You could see the team garages with the mechanics packing up. McLaren’s crew, all wearing their rocket-red victory shirts, were enjoying well-deserved ice lollies. All the cars in Parc Fermé were slowly being wheeled into the scrutineering section and myself and all the other fans were rapidly filling up memory cards with thousands of photos. Slowly we wandered back to the buses, beaming from the excitement of the race we’d just witnessed and celebrating a British one-two. The Turks have an excellent track and they’d given us a fantastic weekend. It doesn’t have the polish of Abu Dhabi, or the capacity crowds of Monza – neither of which I’ve ever attended – and the organisation was a little shaky at times, but they get the important bits spot on. A great race, a good atmosphere and an excellent view of the action. It’s just a shame the Turks themselves aren’t that bothered about it. Maybe there needs to be some local interest in the form of a Turkish team or Turkish driver. Until then the fans will continue to fly in from all over, and the track will continue to produce great racing. But Istanbul will need an injection of local passion to really establish itself as one of THE great races on the F1 calendar. 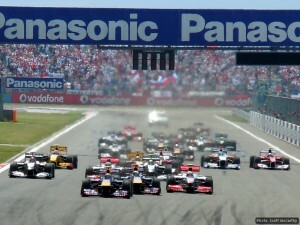 Categorised under F1, tagged under Formula One, Istanbul Park, Turkish Grand Prix.